Well, it was either this, or we get him dressed like the Terminator. Director James Cameron joins the Aliens universe! 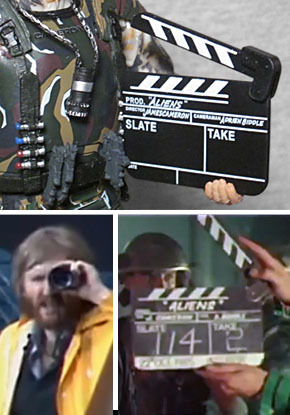 The Colonel James Cameron action figure is a tribute to the process of creating a movie as well as the director himself - among the accessories are replicas of the movie clapboard and the viewfinder Cameron wore around his neck during the filming of Aliens for setting up shots. Yes, this is a toy of James Cameron, famed director of Piranha Part Two: The Spawning and one episode of the Dark Angel TV show. The guy who thinks there are too many superhero movies, but is currently working on five sequels to James Cameron's Avatar, a film that was the cultural equivalent of a goldfish won at a carnival. Col. Cameron uses the same mold as Sgt. Windrix - the USMC uniform with the long sleeves. Yes, Pvt. Frost used it, too, but Windrix is where it was first seen. The armor, however, does come from Frost: there's the same chest plate all the Marines wear, but the straps are only shared between those two figures. There are four shotgun shells on both of the straps, and some kind of clips on the belt, plus a holster hanging on the right side. That does cause a slight problem, in that James Cameron is left-handed, but the toy is molded to hold all the weapons in its right. Cam's colors are unique. Like Frost, his BDUs are lighter than you might expect - at least, when judged against Hicks and Hudson. If you look at Vasquez, her basic outfit isn't very dark, either. 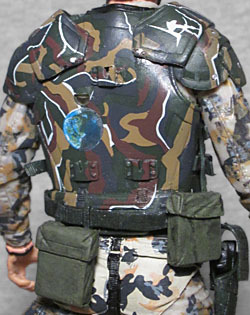 The camo pattern is unique (ie, not reused masks from any of the other figures) and since Jimmy Jam didn't have the opportunity to customize his armor the way the actors did, the embellishments are simple - his name by the neck, a Lighstorm Entertainment logo on his right shoulder (Cameron's production company), and a symbol mostly hidden by his back-mounted flashlight that represents the planet Pandora (not that one). Plus, the flags on his sleeves are Canadian flags, not US. The head and hands are molded in fleshtone plastic, but the neck and wrists are just painted - and boy do the colors not match! The extremities look natural, but the painted parts look like someone just opened up a tube of peach paint and had a go at it. Like he's wearing a pink turtleneck under his uniform. But hey, what really matters is the head. NECA's likeness game is always on point, and this is no exception. Befitting the era of origin, this represnts a mid-80s James Cameron, not a current day version. Sure, his face might not be quite as thin today, but the big difference is that back then he had a full beard and much shaggier hair. Since the only new piece is the head, the articulation isn't any different from the other space marines: hinged toes, balljoints at the ankles, double-hinged knees, swivel thighs, swivel/hinge hips, balljointed torso, hinged hands, balljointed wrists, swivel/hinge elbows and shoulders, and a balljointed head. Some of the joints are stiff, but not "unusable" stiff or "broken" stiff, just stiff. 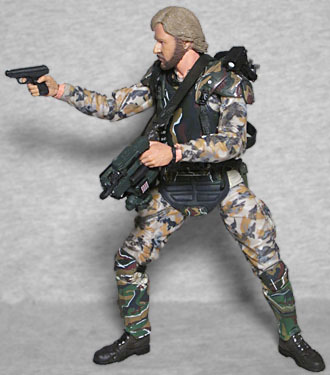 And you'll be able to put all those joints to good use, since he comes with a motion tracker, an M41A Pulse Rifle, and a VP70 pistol to fit in the holster. He doesn't have the Explorer Night Raider knife Frost wore in the movie, but then, I'm not sure the Frost figure had it, either. The new pieces, as mentioned in the bio (if your eyes didn't slide right over it) include two things that never appeared in the movie, but definitely would have appeared on the set. First we have, hanging around his neck, a viewfinder - the thing that shows him how scenes will look through the camera lens, rather than through the human eye. And while that's pretty neat, it's not nearly as iconic as the black clapboard, which is familiar to anyone who's ever seen anything about making a movie. The images and sounds of a movie are recorded separately, so having something that makes a specifically identifiable sound at a specifically identifiable moment makes synching the two up very easy. This is an old-fashioned black and white version, with information about Aliens, and the clapper on top is hinged. It really does look a lot like the ones used in the filming, too! 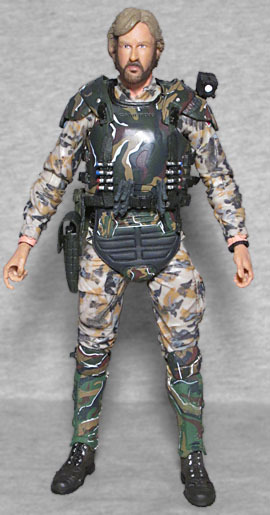 Col. Cameron was a Toys Я Us exclusive, adding to the ranks of directors-turned-toys. He wasn't terribly hard to get - by which I mean "I saw three on the peg, didn't buy one, and when I came back another day he was still there" - but the distribution was slow at best. Some people reported the toy showing up months before other people say it. 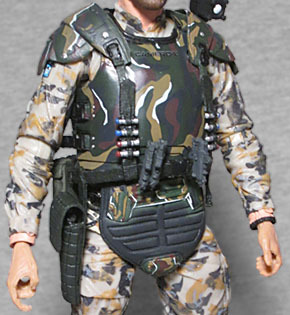 And even if James Cameron doesn't engage in Quentin Tarantino-style cosplay while he's directing, getting an action figure of him as a Colonial Marine is a fun nod to the man and his career.